and from blogging this whole week. I have really and truly missed you! I want you all to know I am doing well. are working in my quick healing! whatever may be the reason for the needed support. I wish I could invite each of you over for tea. all the St. Valentine's eye candy inspirational festivities. I just love it that much! if you aren't using it, why not? 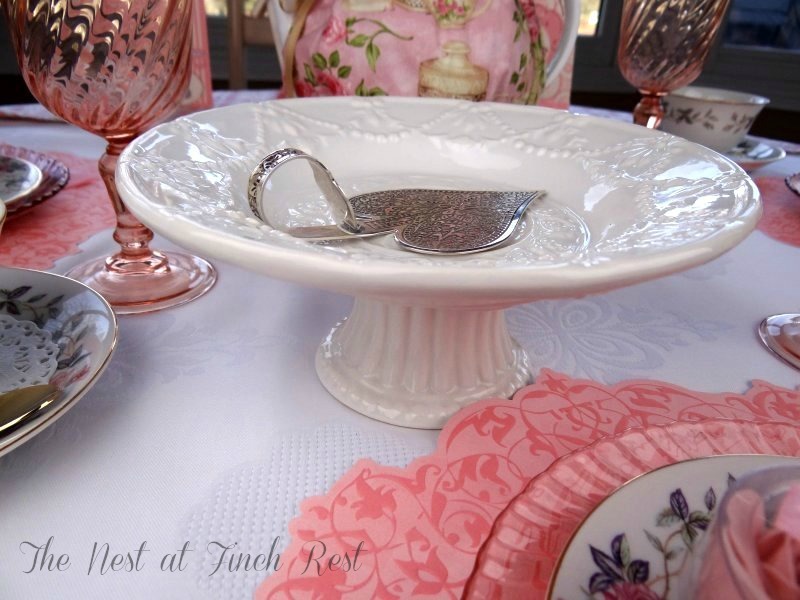 Remember my pretty silverplate heart-shaped server my friend Debbie gave me that I used in my last year's Val Tea? and one I have to share for Valentine's! Trust you are soon back in the pink like your lovely post. Thanks for the sweet pictures. I hope you feeling better. So good to know that you are recovering well. I see that you've been playing and that is always good! What a darling heart server and I'd use that tag a lot if it were mine, too. I do use my tags over and over. Some people are so talented. Michelle...I am so glad you are recovering...that is wonderful news! Don't overdo anything...just keep the progress flowing forward! Lovely post! I'm so glad you're doing well, Michele! Your pictures are so pretty and feminine and I've always loved the color pink!! So nice to hear you are coming along well Michele and I think our blogging community is a caring group, anyone would lend a shoulder if needed. 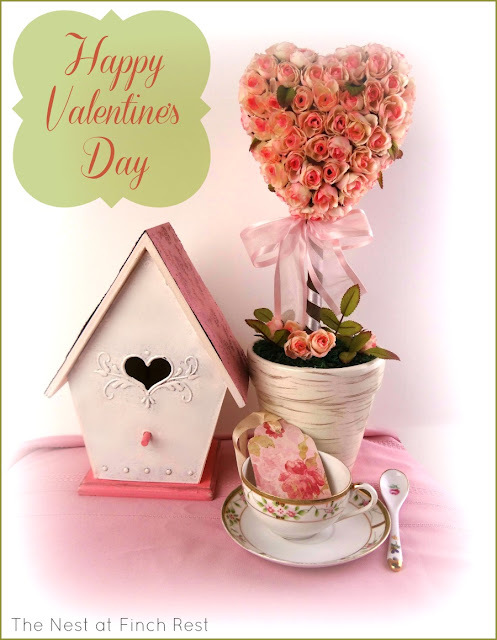 I like all the pretties you're sharing today, love the heart shaped server. Sorry to hear you've been under the weather, keep getting stronger! Your pink decor is just beautiful. Glad you are better, thanks for sharing the lovely pictures! Beautiful photos of your valentines and pretties. Great photo editing. So happy to hear you are better. Take care and Happy Pink Saturday. Glad to hear you are doing well, Michele! I love that tag and I also love your rose topiary. That is very pretty. Hi, Michele! This is my first visit to your blog via Bev's "Pink Saturday", so I did not know you've been ill. It sounds like you are on the mend, and I'm glad that you are "back in the pink" in time for Pink Saturday! 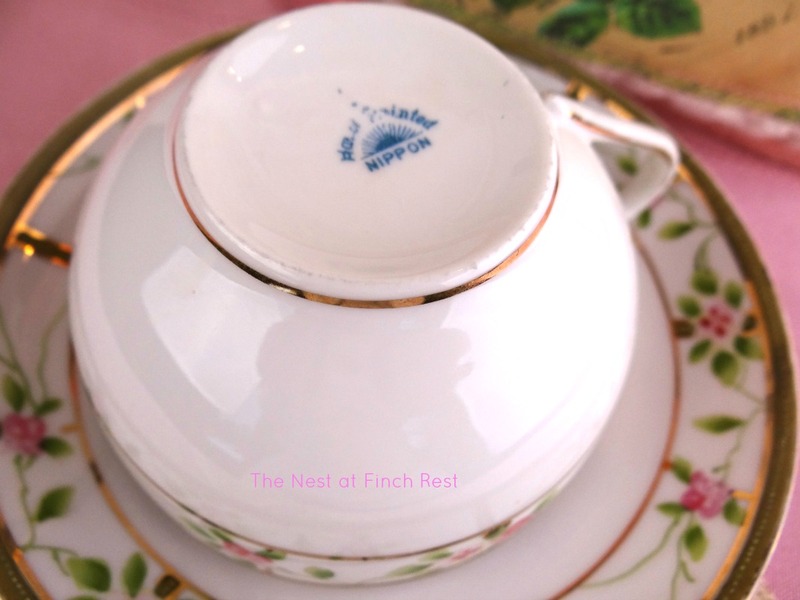 Your vignette is so pretty (love the china pattern! ), and you KNOW everyone's eyes have rested on that oh-so-pretty silver heart-shaped server!!! What a great gift! I hope you feel 100% soon. Have a Happy Valentine's Day! What a gorgeous post! You are more than welcome to share this at my HOME party. It is set up for my tea friends too when they cannot make the tea party on Monday/Tuesday. I have been out of commission too this past week with a bad back. I pulled a muscle early Sunday morning and I could barely walk all week. Hope you are healing up too, my friend. Take care. Glad you are recovering well,Michele. Love your pink valentine post. So pretty! Hi Michele, Hope you are feeling better. The last photo, the pink one, is GORGEOUS! 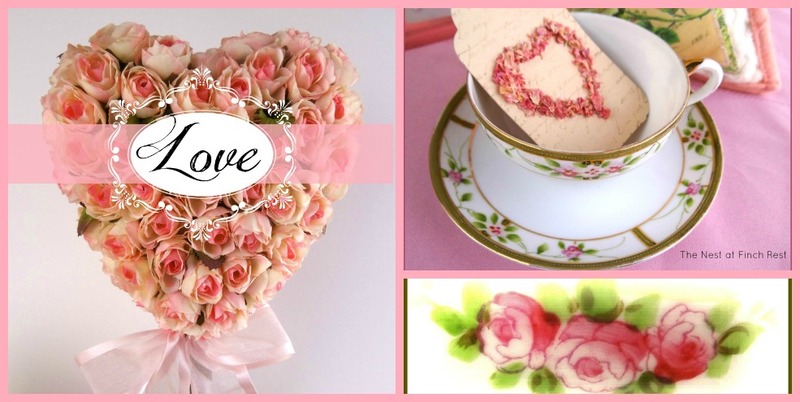 Love your teacup and your pink heart with roses. Lovely Valentine post. Rest and feel better soon what a pretty pink post!! Beautiful pictures! Just the thing I needed to forget about that increasing large blanket of white outside! This is such a beautiful post - thank you so much for linking!!! Lovely HapPy Valentine's PS, Michelle ! I'm so glad you are on the mend. Thank you for sharing your beautiful pink Valentines. I am glad you are on the mend. Thank you for letting us know you are ok.
That heart server is one I have never seen anywhere and it is beautiful. Oh yes, it could come out to play anytime but especially this week. Your post is gorgeous. Love your blog and your Pink Saturday post. Have a wonderful day! Hi Michelle...came to your blog via pink Saturday...what a sweet post this is! 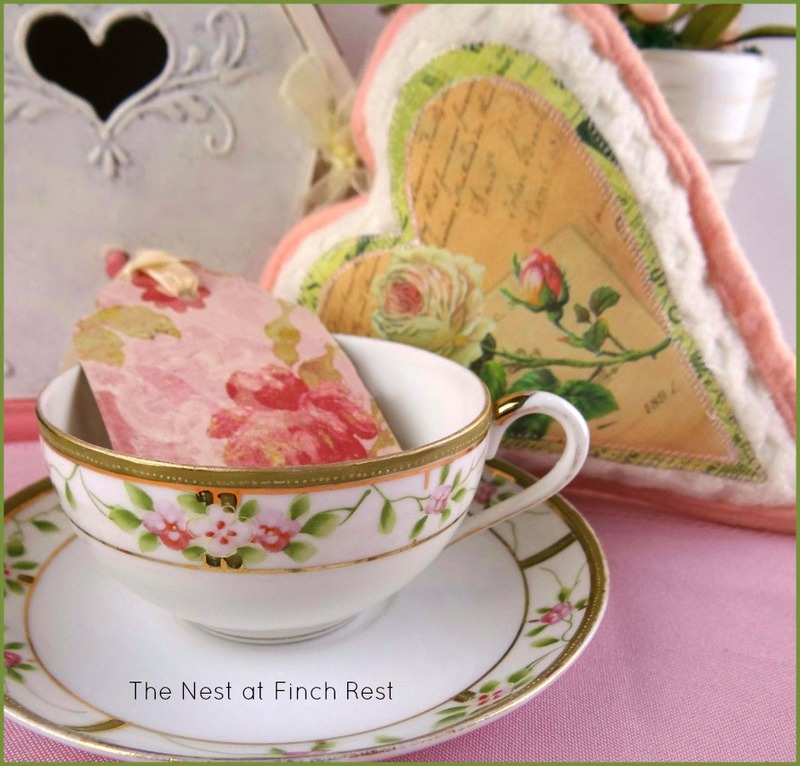 Love the little tea tags and the delicate photos! Thank You for posting and have a blessed week. I didn't know you were not doing well Michele. I'm so sorry to hear you aren't feeling well and hope you are on the mend. If there is anything I can do, please let me know. Your pictures are so lovely. Looks like you are all ready for Valentine's Day. It's not a holiday I decorate much for, so I don't have very many pretty things for it. I've enjoyed looking at yours. I haven't really used Picmonkey - guess I need to go over there and play around with it and get with the program. Always something new coming along to learn. This old lady has a little trouble keeping up. I stopped by earlier but had to hurry - hurry...glad you are doing so much better! Hope you allow plenty of time for rest and recovery! I love all your pinks!!!! Glad to hear you are doing well!!! 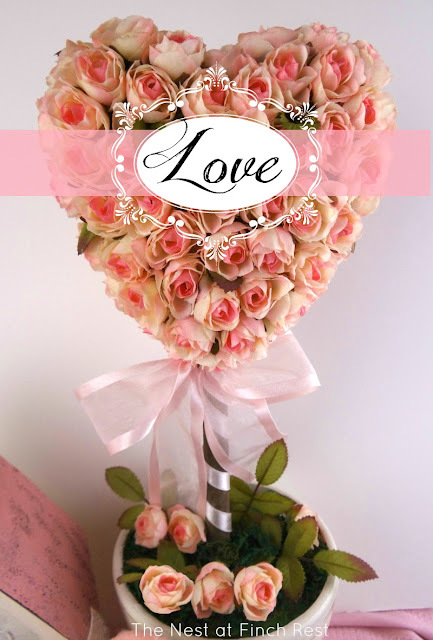 Your Valentine inspired vignettes are breathtaking! I adore your tea setting, with your hearts and romantic cup. That heart server is really something special.Tea really does lend itself to romance doesn't it? How Beautiful all the vignettes are and the heart tag, yes, I would use that often too! Glad you are better and thanks for the wonderful Valentine's post. Oh, I love all your rose things! I am very much enjoying your beautiful blog, which I just discovered by way of the Malevik Rose Garden web site. Sorry to read that you've been ill, and glad you are on the mend. When you mentioned tea, I had to pause in reading this page to go start a cup of herb tea I recently found. It has rose petals in it! Also orange and lemon peel, relaxing lavender and valerian, and other herbs. There's only the barest hint of rose scent and flavor, but I still enjoy it, and even the tags and the packets are of the prettiest shade of pink. I'm hesitant about mentioning the name of a product, particularly on a site I'm new to, for fear someone will think I'm selling something, but I think you and some of your guests would enjoy this, too, so I will tell you that it is called Tazo Rest. I hope that's okay. I have no connection to the company. Tea's ready! I'm going to enjoy sipping it while browsing your blog site. Sounds like you are getting better and on the mend. Smart of you to plan ahead with your Valentine post. Seems like I have to do that a lot with being out of town so much. 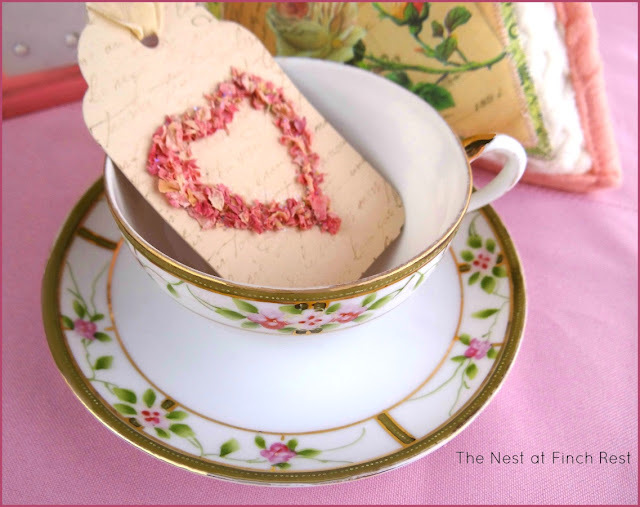 Anyway, your images are beautiful, love the tea cup, tag and heart pillow. The photo editing really paid off and your images are stunning. Take care! OK, so just because I'm into the blue shades right now, I am reminded that my first love will always be pink. Ohhhhhh, how lovely these photos are -- such yummy Valentine's sweetness!